Modern house plans Lagos Nigeria - Nigeria real estate developers have developed new home plans to maximize their profit. These modern home plans are structured to get the most value from the space available. These free tips will help you understand the concept and grow your profit substantially. In the past, many real estate owners built rental homes to their individual taste. Since Nigerians love spacious apartments, older houses were built with a lot of space . . . big living room, large bedrooms, spacious verandah, sizeable stairways, spacious bathrooms, and impressive kitchen. However, as demand for houses rose in Lagos Nigeria, real estate developers and property owners in the Lagos Nigeria housing market started to think differently. The question was . . . why build a bungalow in a plot of 668 square metres when you could have a block of flat in the same plot of land with each flat being 2 or 3 bedroom? a block of four terrace duplex with higher rental price on the same plot of land? Taking it even further . . . what happens if you build a block of 10 units of 1 bedroom apartment in the same plot of land of size 668 square metres especially in busy neighbourhoods that command high rental price? Real estate developers played with these scenarios again and again . . . reviewing options, analyzing the profit potential, and re-analyzing the rental profile in the Lagos real estate market. These business oriented and profit oriented scrutiny gave birth to modern house plans that generated and has continued to generate huge profit for the smart business-minded real estate developers and property owners in Lagos Nigeria. 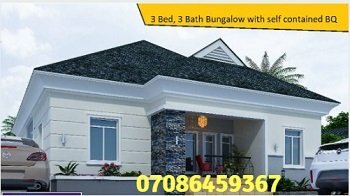 This does not mean large spacious houses have disappeared from new developments in Lagos because of these modern house plans. Of course, not. emerged side by side with optimized apartments. But if you want the luxurious abundantly-spaced properties, you have to be ready to pay for it. Space and luxury now have a price tag. In effect, the real estate market has been segregated somewhat. The mass market . . . the majority of the population fall into this category . . . get their kind of property. And the middle to high income earners as well as the stinking rich also get theirs. So, when you decide to invest in the Lagos property market, you start by choosing the category you want to play in. Then decide how to execute the building project and what contractors to engage. The size of the project will obviously determine the class of contractors you decide to engage for things like house wiring and other aspects of the building construction. Whatever the case, the journey starts with understanding the market and then choosing . . .
Nigeria beckons. A lot of money is up for grab. Just do it right. P.S: Want a building plan for your next house? Click HERE to get bungalow floor plans. Alternatively, Click HERE to get duplex house plans.